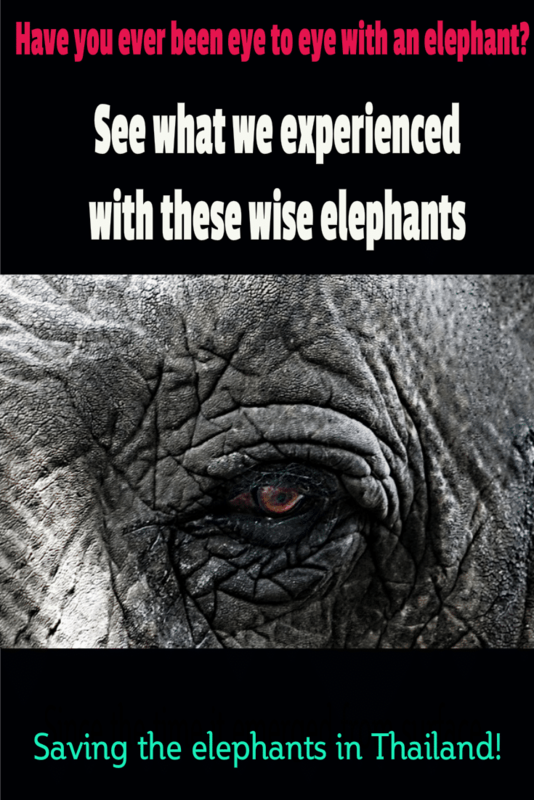 What is it about the elephant? These enormous and majestic creatures captivated our imaginations as children with their long, agile trunks and big flapping ears. For us, they continued to be in our thoughts as we traveled to South East Asia. 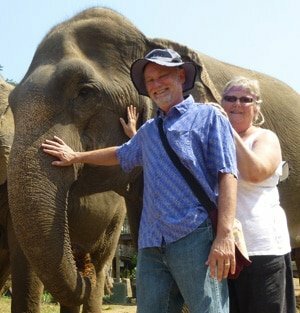 So, of course, one of the top trips on our list for Bali and Thailand was to visit with elephants. We did a lot of research and found that many of the opportunities were expensive and aimed at tourists. We also learned that the elephants may be mistreated at some of the trekking sites. 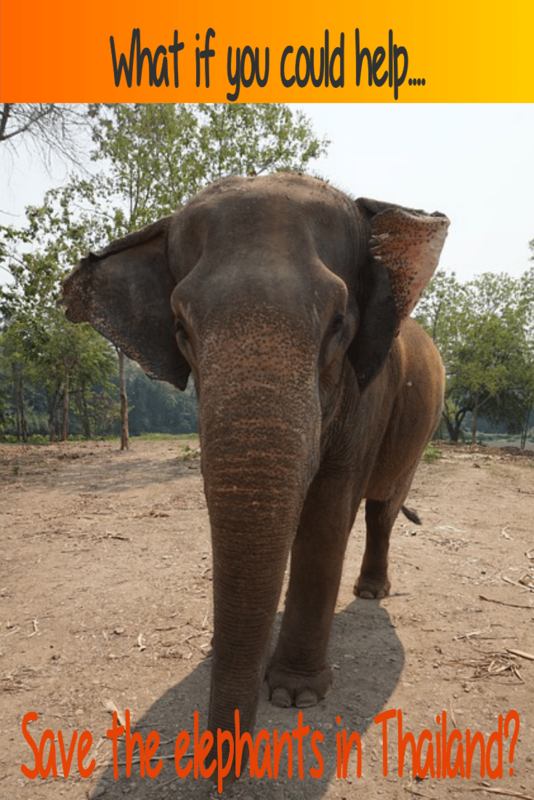 So, we skipped the luxury elephant lodge in Bali, where folks ride on an elephant to dinner, and decided on an elephant sanctuary near Chiang Mai, Thailand. After speaking with our host in Chiang Mai and doing more research we settled on the Elephant Nature Park. The cost for a day was about $80 US per person, including transport to the nature park, lunch and all activities. 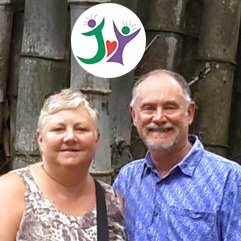 The sanctuary was really well run and we had a unique experience that we will treasure for a life time. Our day began with a small and comfortable van picking us up for the drive to the nature park. The van arrived on time at our designated location. We rode with about 10 folks, our driver and our guide, whose name was Ten, for about an hour. 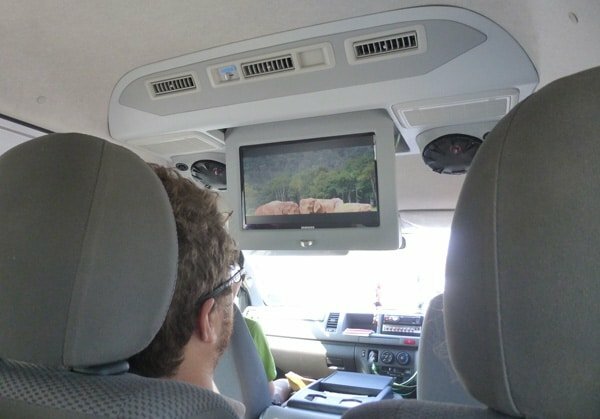 During part of our drive he explained how the day would unfold and then showed us a video about the elephant nature park and the elephant population in Thailand. The last part of the drive took us past some trekking camps and Ten explained a bit about how they operate and what they do differently at the elephant nature park. Our guide had great English skills, could answer all our questions and clearly had a passion for his job. Upon our arrival, we got a tour of the nature park facilities we would use, where we would feed the elephants, bathe them, watch from the viewing skywalk and so forth. We also saw where we could get drinks and use washrooms, change our clothes and meet for a big buffet lunch. While showing us around, Ten would frequently point out an elephant and tell us its name and history. He could do this from quite a distance, easily recognizing each elephant. 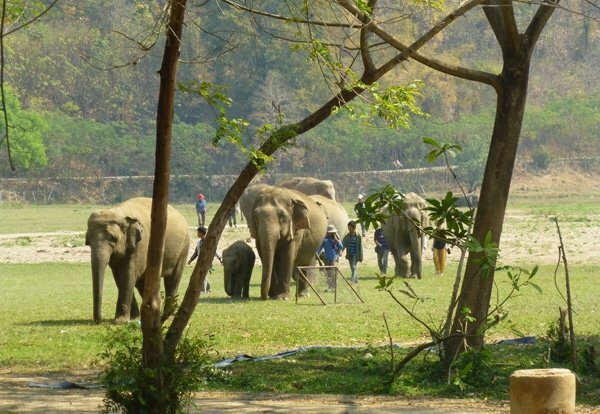 There are 37 elephants currently living at the Elephant Nature Park. During our visit, some of the younger elephants, more used to the wild, have a chance of being released into the jungle, and they were “camping out” as a way of eventually learning to live in the wild. Others are older and were used and abused for many years in the, now illegal, Thai logging industry. Some have broken backs from improper care or broken legs from accidents. Five are blind, some from abuse, others from old age. Five youngsters live at the park, the youngest is a 5 month old male. We learned so much from Ten, that it is not possible to share it all, but here are some of the highlights. We were taken to the medical clinic to meet the elephant who is healing from a wound that was infected. She has to stay enclosed to keep from scratching her wound. One of her adopted elephant friends stays close by to keep her company. In fact, one thing we were fascinated to learn was that these rescued, orphaned and unrelated individuals form themselves into family groups and look after each other. When a very wounded elephant arrived, blind and in need of special help, another adopted her and watches over her as a best friend! Feeding the elephants was so fun. We stood near a railing and held out big chunks of food which they gracefully gathered from us in their muscular trunks. It felt a bit funny at first to feel them taking the food in the tight curl of their trunk. Some folks dropped the food and the ellies would just deftly scoop it right up. They eat for about eighteen hours a day, so we had lots of opportunities. Most of them eat whole watermelons, pumpkins and large bunches of bananas in one bite. A few have digestive problems or needs for special nourishment, so they get cooked pumpkin and peeled fruit. We fed one such gal her afternoon snack, two laundry baskets full of cooked pumpkin and peeled watermelon, while fending off some of her neighbors who wanted in on the treats. The storage area for elephant food hold enough for a few days. We saw staff or volunteers sitting and peeling and cutting big baskets of food in the pantry area. We wandered a bit and got to get close and learn the names of some of the sweet, older residents who let us touch and visit up close with them. Then we had a lovely and extensive vegetarian lunch together with all of the small groups who were visiting, maybe 4 dozen people were at the park that day, not including the staff and volunteers. 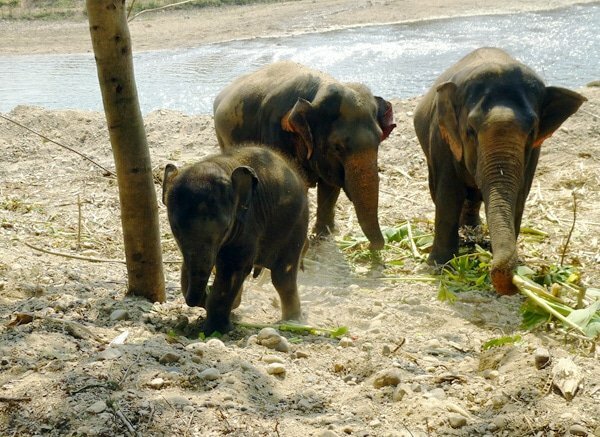 They are ecotourists who pay about $400 a week to help feed, wash and care for the elephants, shovel droppings, cut plants and help out in the kitchen. Each elephant at the nature park has a mahout, or handler to look after him or her. These folks live on the property, many with their families. 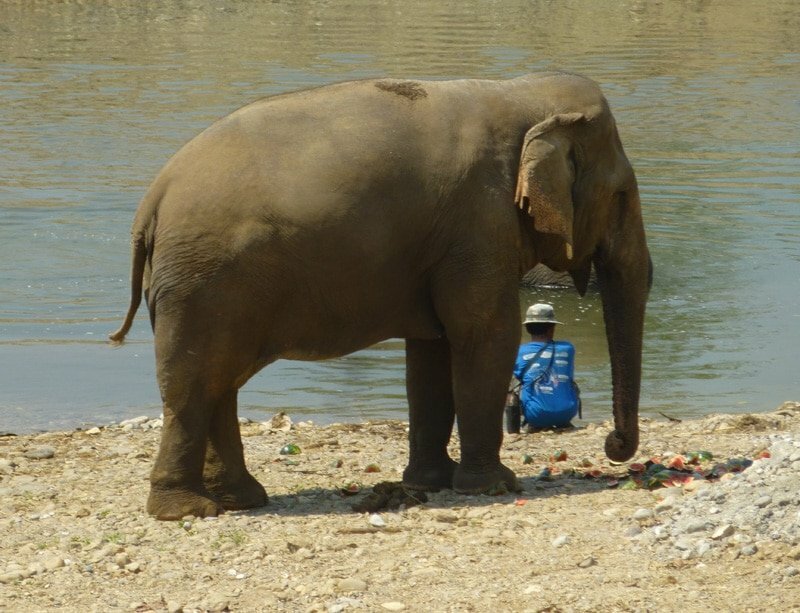 In the afternoon the mahouts brought the elephants down to the river for a cooling bath. We got buckets, changed our clothes and went down to the river to slosh them with cool river water. After getting all clean the elephants cover themselves with mud, a great sunscreen to protect their skin. An elephant only sweats from its toenail area; elephant skin is very dry. We were able to touch their trunks, cheeks and ears. Sometimes they flapped their ears which are big and feel strange on the back of your head! One great thing about the trip was the beautiful and spacious location. 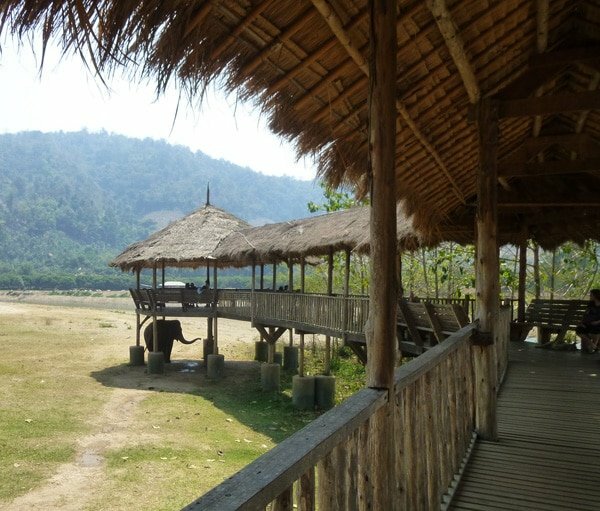 We saw the big open spaces available for them to roam, the river for bathing and the jungle covered hills in the distance, known by the staff as Elephant Heaven. In the afternoon we even met Sangduen “Lek” Chailert, the founder and visionary powerhouse we had learned about in the video. This determined woman rescued one very frightened male when he was young. She named him Hope and cared for him round the clock until he became her trusted friend. We saw how the elephants loved and connected with her, live and in person! 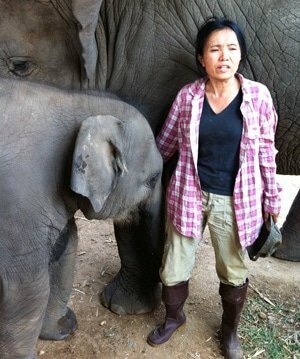 We were given a few chances to see, but not touch, the youngest elephants, only months old and still nursing. Each had a mom and a few self appointed “nannies” in their family. Any sign of trouble and the babes were quickly surrounded by the whole family. During our visit there was a cremation being held in the nearby village. At one point they set off a loud fireworks explosion. We were very close to a group who were eating and felt the power as they charged in the direction that junior had gone when frightened by the noise. Later, we watched the five month old male and his family munching banana leaves about 15 feet down an embankment. While Laurie was making a video on her phone, the “little guy” headed up the slope right toward her. Before she could get out of the way he charged at her and she felt the power of his front flank push against her. He was protecting his territory, Ten said. No one seemed concerned, but it was a surprising display she won’t soon forget. Through out the day, we had many opportunities to touch, feed and visit with the elephants, as well as the hundreds of rescued dogs and cats on the property. Ten was always available to answer questions or just hang out with us on the shaded skywalk. The day was relaxing and exciting at the same time. As we boarded the van with our companions from the day, Ten was along for the ride home, asking if we had enjoyed the day and chatting with us about Lek and her wonderful life’s work. We arrived home awed and full of gratitude for these magnificent creatures and the people who have dedicated their lives to helping them. The following video is a comprehensive look at the Elephant Nature Park from the point of view of the ecotourist volunteers who help take care of the elephants. Save this for later. Pin it! I loved this post, how wonderful for you to have this experience. 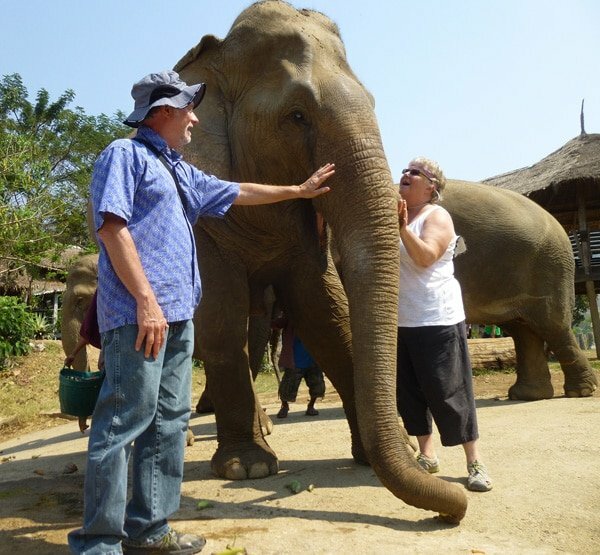 My very dear friend spent the week of her 70th birthday as a volunteer at this elephant park, so you were giving me more insights to her time there. One of my life dreams is to visit this place. Cheers, Sue. Thanks Sue. In all our travels, this is the experiences that had the most impact. We truly felt the intelligence and wisdom of these citizens of our planet, and we felt humbled by it. Love this place, We spent a day there as well and it is amazing. We also found the information they supplied was very educational and we found it is such a rewarding experience.